The cat’s out of the proverbial bag. The not-so-secret to Georges St-Pierre’s (pictured) success is his unparalleled ability to plant his opponents on their backs. The reigning UFC welterweight king has followed the same recipe since getting TKO’d by Matt Serra in arguably the biggest upset in mixed martial arts history. After the April 2007 upset special, St-Pierre has rattled off 10 consecutive lopsided victories en route to reclaiming his throne. St-Pierre looks to post his eighth straight title defense this Saturday at UFC 158 against Nick Diaz. 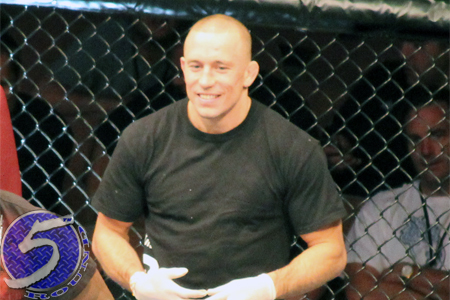 Despite Diaz’s extensive jiu jitsu repertoire, there’s no reason to believe GSP won’t impose his all too familiar dominant wrestling game on his bitter rival. Well, St-Pierre would be digging his own grave if he dares to enter Diaz’s domain on the ground – say Diaz supporters. BJ Penn is the most skilled submission specialist on GSP’s résumé and “The Prodigy” wasn’t close to tapping St-Pierre in either of their two fights. It’s debatable whether Diaz is as talented as Penn is on the ground, but Diaz opted to keep their scrap standing when he steamrolled Penn at UFC 137. While St-Pierre hasn’t submitted anyone since catching Matt Hughes in an armbar nine outings ago, the 31-year-old does own a Gracie jiu jitsu black belt. So St-Pierre didn’t just fall off the turnip truck. Speaking of Hughes, the former “greatest welterweight of all time” is the only man who can stake claim to submitting St-Pierre. That was nearly nine years and 17 fights ago. So what does this all mean, Diaz stands no chance against the baddest 170-pounder in bare feet? No, he has a puncher’s chance – but not in that lucky, one-strike KO kind of way. Diaz is believed to have the superior hands and he needs to put his mitts on display in Montreal. If he’s able to avoid the clinch and keep from staring up at Bell Centre’s ceiling, Diaz should be able to methodically pick St-Pierre apart in a standup battle to overcome his 3.5-to-1 underdog status. Those are some pretty big ifs, particularly since St-Pierre has the best takedown percentage in UFC history. According to FightMetric, GSP plants his opposition on their backs at a 78.1 percent clip. Despite the monumental task Diaz is facing, GSP vs. Diaz remains the most anticipated welterweight affair the Octagon has ever hosted. It is undeniably must-see TV. Unfortunately for Diaz, the result may be a rerun of St-Pierre’s last 10 shows.